We have been adding some new maps recently to MapTube, our most recent being the global price of Big Mac’s around the world. Based on the Big Mac Index which according to the Wiki was “introduced by The Economist in September 1986 as a humorous illustration and has been published by that paper annually since then. The index also gave rise to the word burgernomics. One suggested method of predicting exchange rate movements is that the rate between two currencies should naturally adjust so that a sample basket of goods and services should cost the same in both currencies. In the Big Mac Index, the “basket” in question is considered to be a single Big Mac burger as sold by the McDonald’s fast food restaurant chain. The Big Mac was chosen because it is available to a common specification in many countries around the world, with local McDonald’s franchisees having significant responsibility for negotiating input prices. For these reasons, the index enables a comparison between many countries’ currencies. Some menu items are market specific, which would hinder a comparison, if used. Still other menu items are specially priced, such as the dollar menu in many U.S. restaurants consisting of sandwiches and other items that cost $1″. 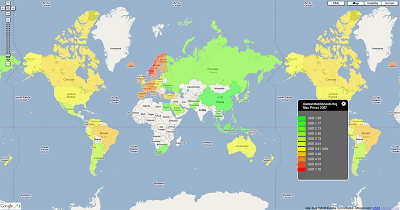 Mapping the index provides and instant guide to prices around the world – it makes interesting viewing, China is by far the cheapest place for a BigMac, visualised all thanks to the increasingly easy ways to view and create geotagged information. You can View the Map yourself via MapTube, data thanks to The Economist. See the Big Mac Index Wikipedia page for more information. Full RSS feeds please! Didn’t you use to have them? We have been trying a short version of the RSS feed these last few days just to see how it goes..
As far as I know, there are about 20 McDonalds in Morocco. And I asssume there are some in Israel… Quite strange that these countries were not selected by the Economist! A nation with a McDonalds shall never be invaded by the US. Forget Nulcear Weapon shields, or new weapons. Get a McDonalds, you will not be attacked by the US. Friedman states in his Theory of Conflict Prevention in The Lexus and the Olive Tree (2000): “when a country reached the level of economic development where it had middle class big enough to support a McDonald’s network, it became a McDonald’s country. And people in McDonald’s countries didn’t like to fight wars anymore, they preferred to wait in line for burgers”. does anyone know why the prices range in different countries? Is it perhaps so more people can afford the food items?